Minister of Foreign Affairs Hon. 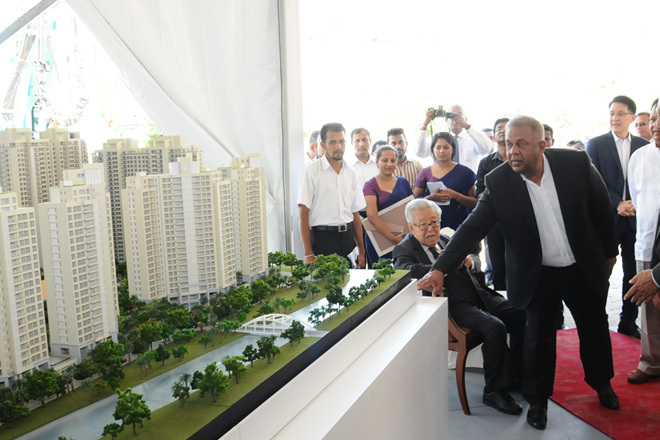 Mangala Samaraweera attended the Groundbreaking Ceremony and the Inauguration of the Havelock City Commercial Project as the Chief Guest on 28th December 2016. The Havelock City Commercial Development Project, an initiative undertaken by the same developers of the World Trade Center in Colombo, will comprise of an Office Tower providing Grade-A office space and a large shopping mall built to international standards. Speaking at the event, Minister Samaraweera stated that the property development industry is bound to grow going forward and that it has a huge potential to attract investment to the country. Minister of Megapolis and Western Development Hon. Patali Champika Ranawaka, Minister for Special Projects Hon. Dr. Sarath Amungama and Hon. A.H.M. Fowzie were also present at the ceremony.